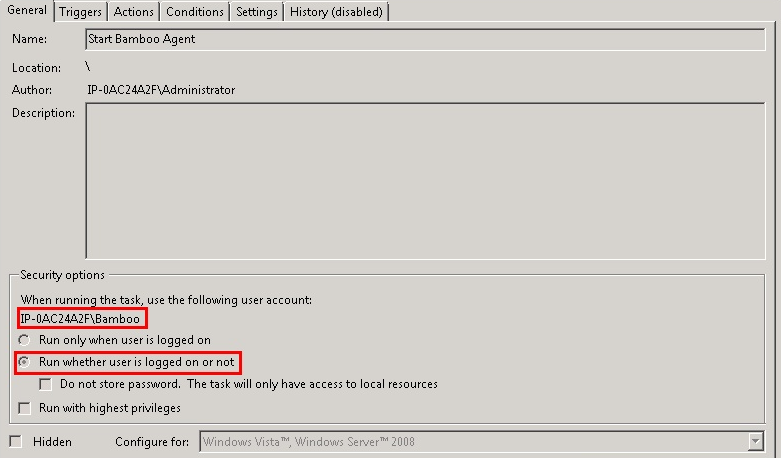 To perform the tasks listed below, log in to your instance with an Administrator account using Remote Desktop Client. Create the user account that will be used by the Bamboo agent. The account name is up to you, I will use Bamboo in the examples below. All builds running on your machine will use this account. It can be a regular user (i.e. it does not need to be a Power User or Administrator, unless your builds require it). Set up a password for that user. 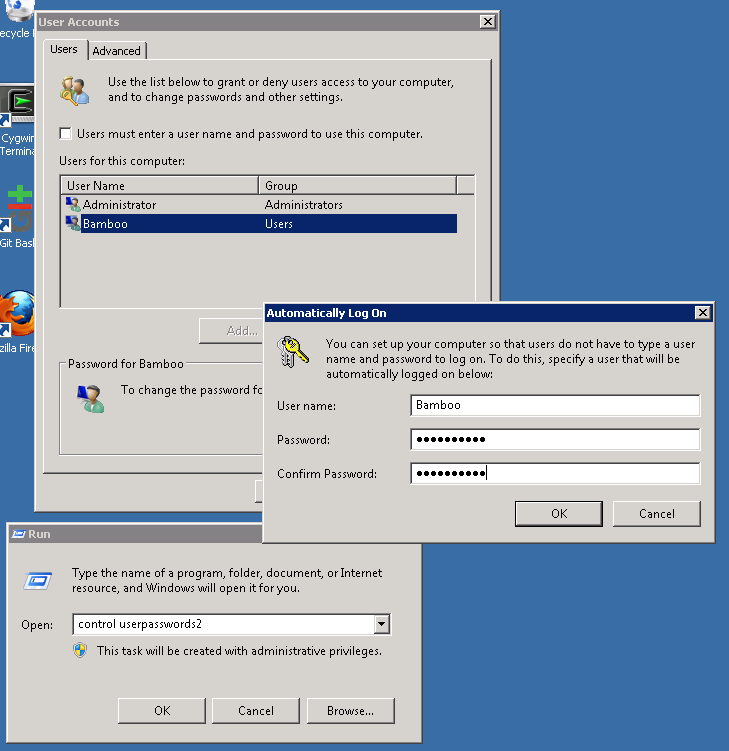 The default user on a Windows image has a user name of Bamboo with a password of Atlassian1. Important: by default, a newly created user should be denied remote login rights (which is as we want it to be). To be on the safe side, please make sure that you indeed cannot log in using that user's credentials (unless you change the credentials to non-default ones). 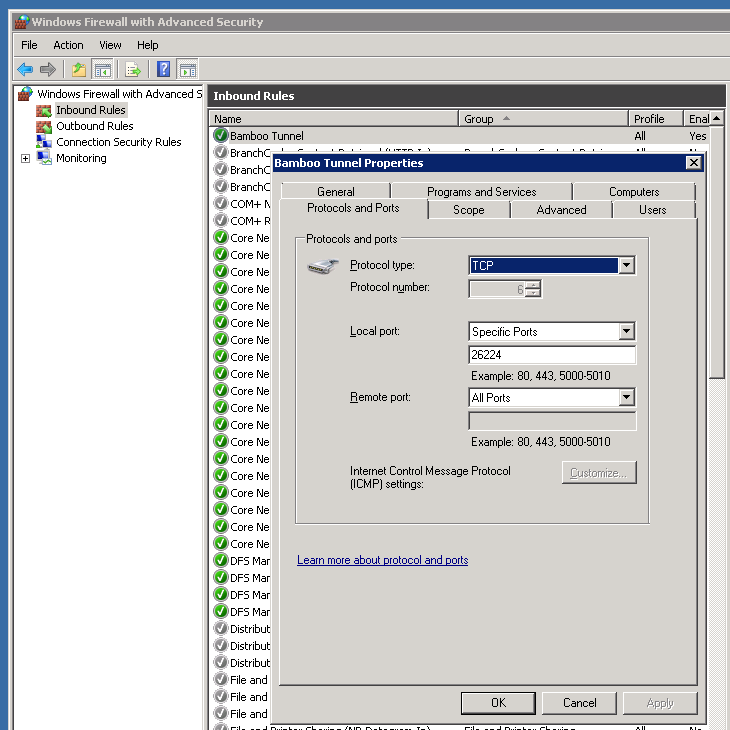 Reconfigure the Windows firewall to accept TCP connections on port 26224. No other inbound connections are necessary for Bamboo. Install a supported Oracle Java version. See Supported platforms. Download the latest version of agent installer zip from this this location (at the time this guide was written, the latest version was this). Unpack it to a desired location, we suggest using C:\opt\bamboo-elastic-agent to match stock images distributed with Bamboo. Starting with Bamboo 5, you'll be able to use custom Elastic Block Storage with your Windows instances. 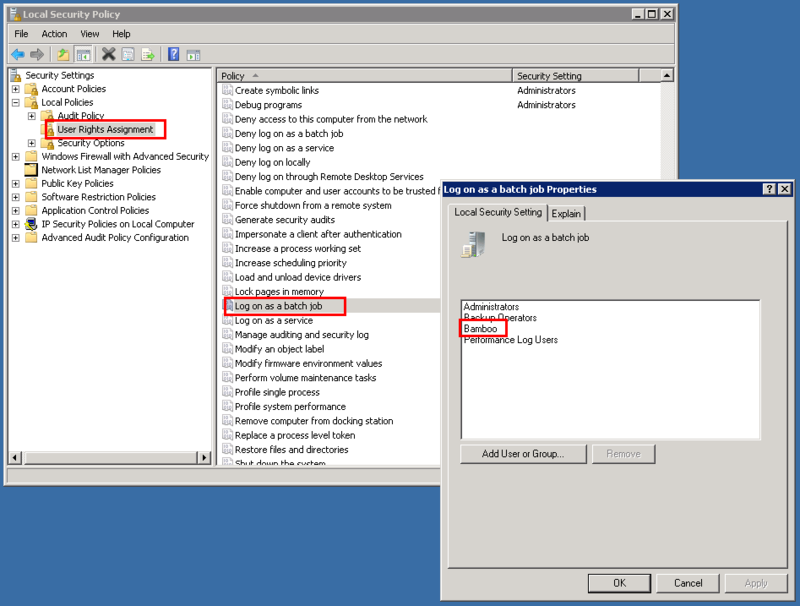 To do that, you need to change the SAN policy on your instance, otherwise the disks will be attached in 'Offline' state with status text "the disk is offline because of policy set by an administrator". and press Enter. You can then quit Diskpart; the new policy will now be active. The easiest way to check if everything is set up correctly is to run the task you've defined using Windows Task Scheduler (Start > Administrative Tools > Task Scheduler). Right-click on the task and select Run. Always test the script using the Task Scheduler; if you run the script manually, you'll use Administrator account, which is not what we want. Look for the %USERPROFILE%/bamboo-elastic-agent.out file. If it exists and contains an error message stating that agent was not run within an EC2 instance started by Bamboo Server, you’ve successfully completed the customization. Bundle your instance. Make a note of the AMI id of the new image. If you fail to complete the following steps within ~40 minutes, Bamboo will shut down your instance, so remember to save your work if you’re running out of time (i.e. create an interim image). Update/create /opt/bamboo-elastic-agent directory structure by creating additional directories. If they appeared, Java is working correctly on that machine and the connection to S3 is working. Start the agent, which will create the Bamboo Agent Home directory and populate it with data pulled from the Bamboo server. If everything went well, you should see the agent appear in the Bamboo instance list. Congratulations, you have a working Bamboo agent. Because the agent has just synchronized itself with the Bamboo server (because it has downloaded all the jars exactly matching what you have on your server), as an extra step, you may want to save that state to speed up future instance startup and reduce bandwidth usage. save the image, define a new image confguration, kill the instance, and try running it from Bamboo.